Today at TGS I got to sit down with Monster Hunter 4 Ultimate on the 3DS. Simply put, it's Monster Hunter as you know and love it, only now with more focus on the vertical space. For the demo, I and two Capcom representatives proceeded to hunt a giant crab. While I have tended to be a bow user in past Monster Hunter games, I decided to try out the new “insect glaive” class of hunter. The insect glaive—a long spear-like weapon—has two special features. First of all, it is able to launch an insect at the enemy which then harvests materials from the monster mid-battle. Second of all, it allows you to pole vault into the air for an aerial attack—and in Monster Hunter 4 Ultimate aerial attacks are key. After a monster has been weakened, it is possible to hop on the monster's back and—through a quick time event—ride it into submission. This allows your other teammates a brief window of attack where the monster is completely helpless. But more than that, it makes you feel like an eternal badass when you pull it off. Of course, insect glaive users aren't the only ones able to hop on a monster's back. Any class can do it. However, they'll need to jump off a ledge or cliff. Luckily, the game was clearly designed with that in mind. Each zone has several levels of verticality for you to exploit. Thus, luring a monster to the bottom of a cliff is always a good idea tactically. The other big addition to Monster Hunter 4 Ultimate is purely technical: you can connect to other players over the internet using a wireless hub—i.e., you no longer need to connect through a Wii U like in Monster Hunter 3G Ultimate. In the end, we defeated the giant crab and finished the demo—though I'm not sure how much I helped out my Capcom representative teammates. And frankly, what I got from my time with Monster Hunter 4 Ultimate is that, for the most part, it's just more of what you've come to expect—though with a few tweaks and additions that fans will really enjoy. 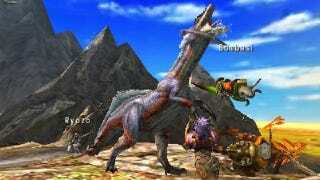 Monster Hunter 4 Ultimate will be released in North America sometime in 2015.